Avidemux is a video editor designed for simple cutting, filtering and encoding tasks. It supports many file types, including AVI, DVD compatible MPEG files, MP4 and ASF, using a variety of codecs. Tasks can be automated using projects, job queue and powerful scripting capabilities. Cross-platform (Linux, BSD, OS X). Alternatively, X-Avidemux and Avidemux Portable are also available. I gotta agree with @smaragdus its up to the anti-virus developer to correct their mistake naming something as malware or anything bad when in fact it is not! I have used this software for quite some time and really like and its easy to use & works great. There is a v2.6.21, only for x64. "same as 2.6.20 with x265 encoder fixed on win64"
Love this software to do quick edits (just cutting out a clip from a longer video), or to convert file types (avi->mp4). If the codec remains the same it will be done in seconds! Simple x264/x265 Launcher is a lightweight front-end for the x264 H.264/AVC as well as the x265 H.265/HEVC encoder, based on the Qt toolkit. It uses the 64-Bit version of x264 with the 32-Bit version of Avisynth. That lets you use 32-Bit Avisynth plug-ins (e.g. DGDecodeNV) and still benefit from the speed improvements of 64-Bit x264. Optionally you can also use 64-Bit Avisynth, which is still considered experimental, if desired, as well as x264's built-in LAVF/FFMS input. Includes full batch encoding support for running several encoding jobs in parallel. Updated x264 to revision 2935 (API v157), x265 to version 2.9+1, build environment to Visual Studio 2017 with Update-8. Improved initial window size on the "High DPI" screen. Sorry, errata corrige (info's missing here on portablefreeware): you can avoid the user's %localappdata% folder entries renaming "x264_launcher.exe" into "x264_launcher_portable.exe". Symantec Endpoint Protection is detecting netc.exe as a risk, and quarantining it. 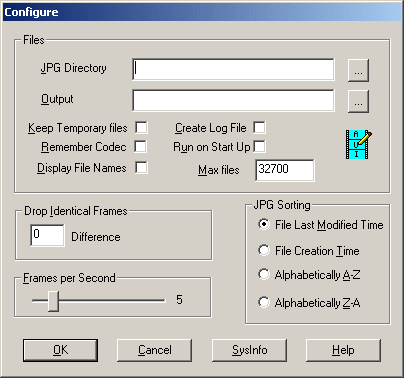 JPGVideo creates a video file from a series of JPEG Files. These files can be from any source, as long as they are all the same size. The video can be created using any video codec installed on your machine. Works OK for me. Unpacked, installed, ran it. Tried it with a few pictures -- it converted them to AVI video. Please note that the best results are obtained with pictures of moderate sizes, e.g. 640x480 pixels (most digital cameras will produce much larger pictures, which may cause the codec or this software to malfunction -- in my case it did not cope very well with 5 megapixel pictures). I used another portable freeware to convert all pictures to 640x480 (this was Irfan View, also known as I_VIEW). Hope it will work for you too. Excellent small program. I had the same problem as Local...installing it normally it works, but try to move it to another directory and no go...is this app really portable (using v1.05)? Very strange...it seems to not run if an Explorer Window for the program folder is open...create a shortcut, place it somewhere else, close the open program folder, then run the shortcut, and all's well...? VirtualDub is a video capture/processing utility. It lacks the editing power of a general-purpose editor such as Adobe Premiere, but is great for video capture and transcoding via third-party video codecs. It can also read MPEG-1 video files by default but requires Plugins Pack to open more types of video (adds FLIC, FLV, Matroska, MPEG-2, AC-3 and WMV). VirtualDub Portable is a PortableApps.com format wrapper for VirtualDub. Alternatively, X-VirtualDub is also available. Dependencies: Video codecs such as DivX, XVID, etc. Unicode support: Partial. VirtualDub supports unicode, but the PortableApps launcher doesn't. ExtEnc: Added %(outputbasename) to insert output filename without extension. ExtEnc: Editor UI now has a drop-down for tokens. Filters: Expanded color space support in resize filter. Preview: Return now also stops preview. AVI: Added Copy button to AVI file information dialog. AVI: Fixed bitsPerPixel value for NV12 output. Capture: Improved error handling in screen capture module. Capture: Fixed sporadic errors in DXGI 1.2 screen capture mode related to tracking pointer shape changes. Capture: Spill drives can be adjusted on Windows XP. Display: Fixed regression in D3D effects display mode. ExtEnc: Fixed weird selection behavior when duplicating item. Filters: Fixed script operation for Convert Format filter for the new modes. Filters: Fixed crash when attempting to crop video in a format that isn't AVI-compatible. Filters: Fixed cropping errors on alias format filter. Filters: Fixed issues with interpolate filter in nearest mode. GIF: Fixed shifted presentation timings when reading animated GIFs. Render: The processing priority setting now correctly adjusts the priority of filter and compression worker threads too when multithreading is enabled. TARGA: Fixed vertical inversion issues during read. UI: Add Windows 8.1 per-monitor DPI awareness support. @Joe: Try to edit the "VirtualDubPortable.ini" file from the "VirtualDubPortable\App\AppInfo\Launcher" folder by commenting/removing the following line: "ProgramExecutable64=VirtualDub64\VeeDub64.exe". That worked. You are a genius!! Thank you.